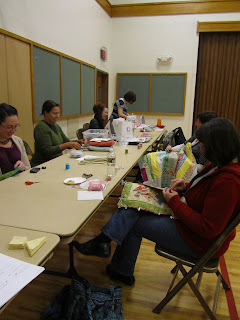 Saturday was our monthly meeting of the NEMQG. We met a Laurie's church which has a nice big gym to baste our quilts in. 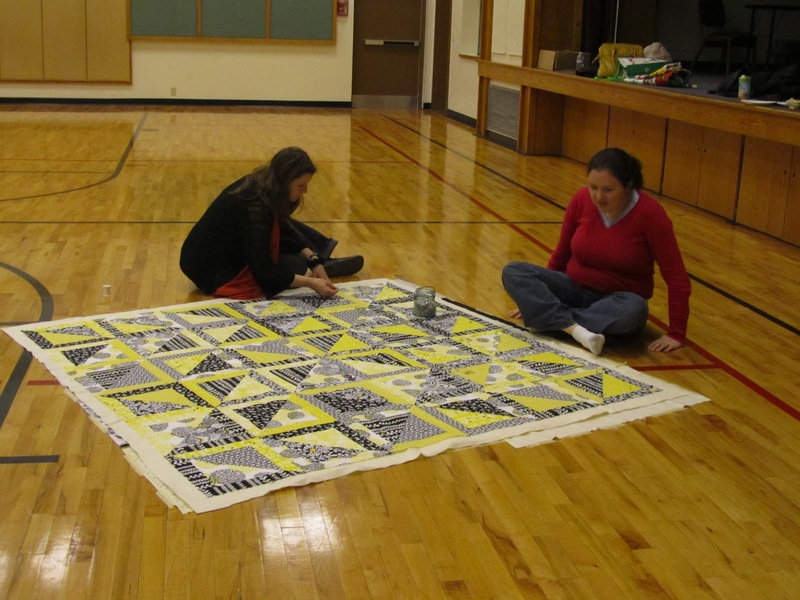 Laurie basting her quilt above. 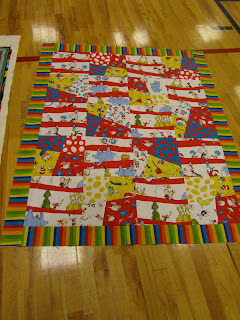 We also got to see Jill's quilt top minus the outside border made with her blocks from our bee. She was the first to go in the bee and it's great to finally see one close to completion. She was also laying out some blocks to determine positioning on the floor. 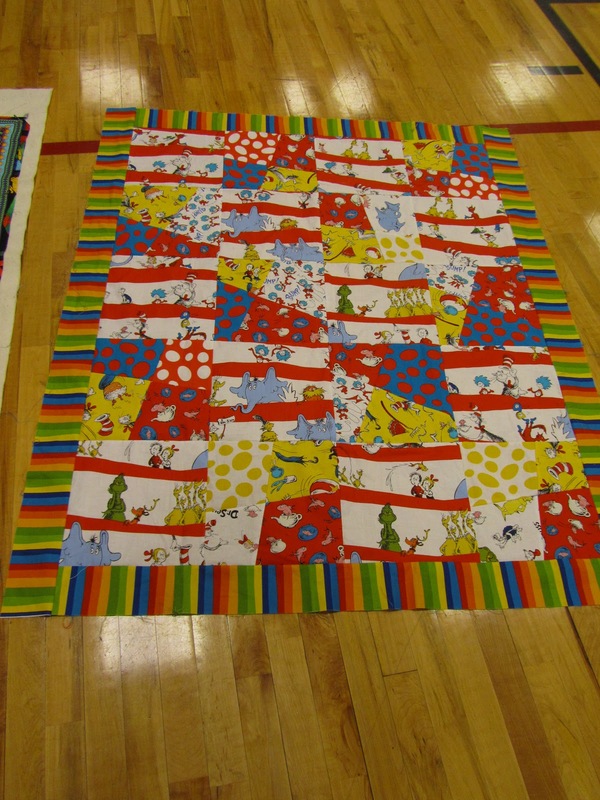 And KK showed off her two adorable quilts that she's making for some soon-to-be born twins. I basted one of my quilts but of course forgot to take a picture. 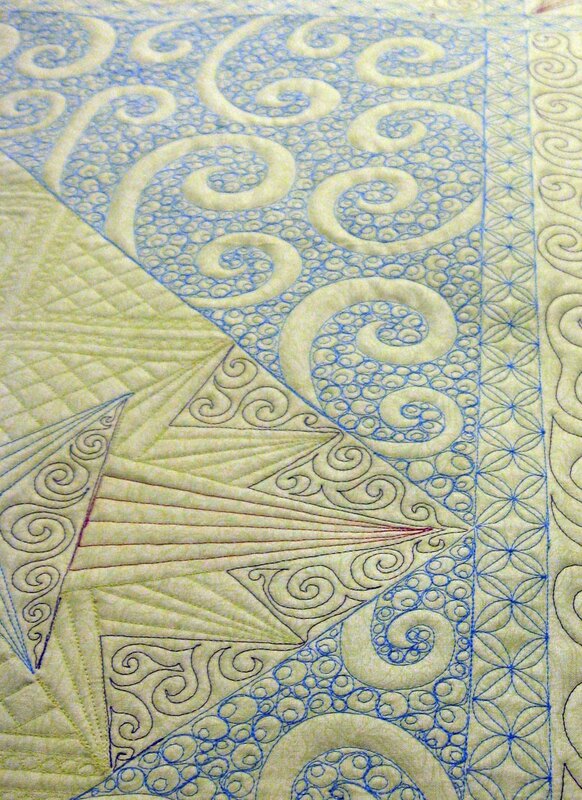 I also did a bunch of cutting for a storm at sea quilt that I'm preparing to make for my parents. I've been auditioning some fabric choices for my newly quilted quilt and I thought I'd ask for opinions. I have my opinion and my DH has his, but I wanted some other opinions. Here are three choices pinned up next to the quilt. All three of these fabrics appear in the quilt. The green in the darker green used in the stars, darker than the large patch of green. The maroon is the one used with the pink in the stars. I don't have enough of the light blue in the sashing to use for the binding. I wish I did because I think that would look nice. Thoughts??? What one do you prefer? Or would you go with something different? 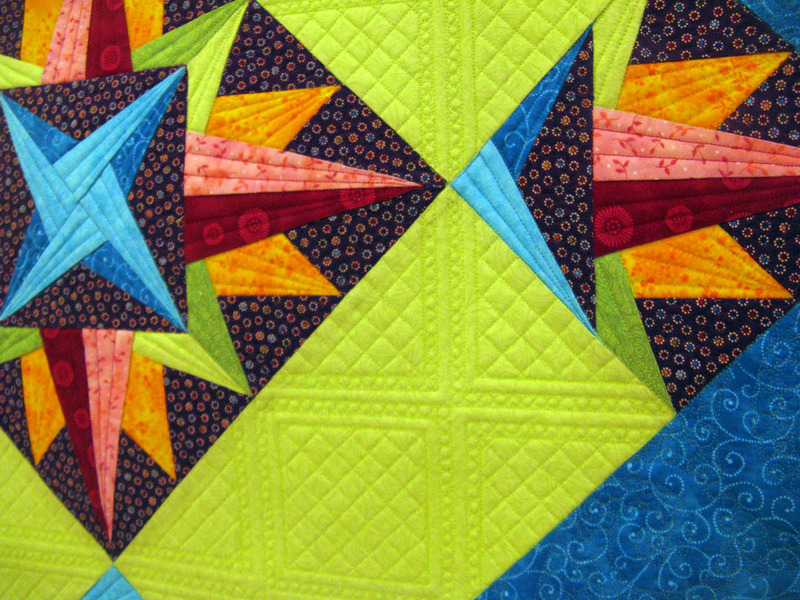 A finished up block 7 of the Fat Quarter Shop's Designer Mystery BOM recently. I have blocks 8 and 9 that I need to make up. Yes, I'm behind. I'm actually behind on both of my BOMs. Oh well, it is what it is. Life has been crazy lately. I'm not on a deadline or anything. 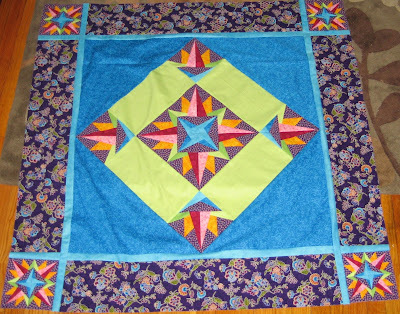 I find that when I put myself on a deadline that it just stresses me out and takes the fun away from quilting. 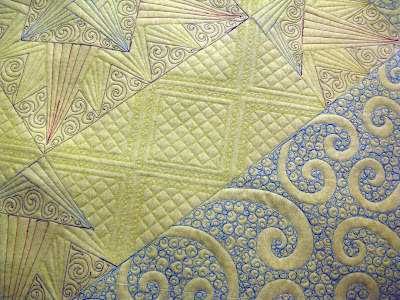 I want quilting to remain fun, so I will continue to do things on my terms and not stress out about being behind. I love this block. Isn't it cute? I think so. Believe it or not, in my 8+ years of quilting, this is the first time I have ever made flying geese. I don't know why. I don't have an aversion to them, I just have never made them. Now I can say that I have. 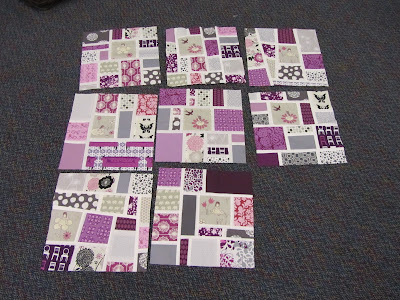 Here are the first 7 blocks all together. 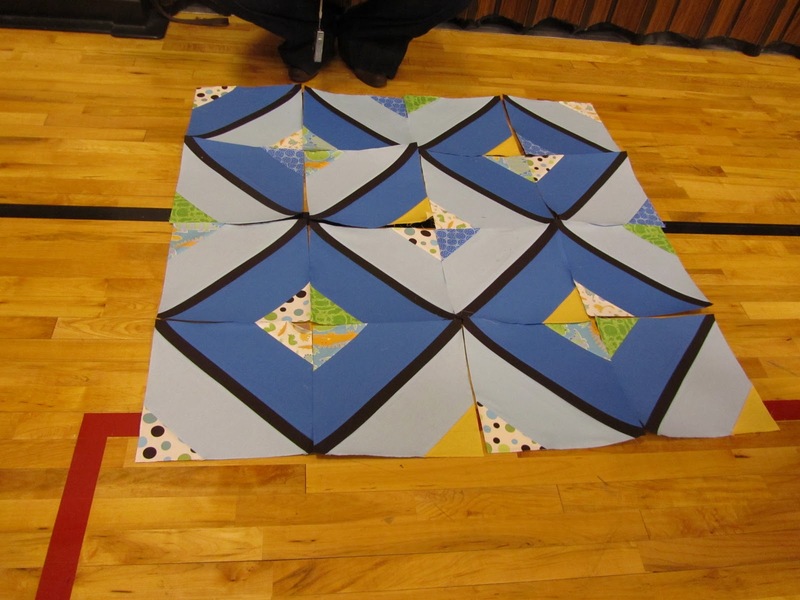 Once finished the quilt will have some sashing in between all of the blocks. Okay, go ahead and laugh at the title. Can you tell that I'm excited? 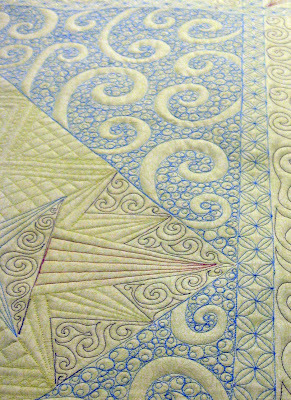 Judi over at Green Fairy Quilts finished quilting my "Fire and Ice" quilt this week and she shared some photos of the finished quilt. It shipped out to me yesterday and I can't wait to receive it and study it up close. These photos are from Judi. I'll take more of my own when I get the quilt. I love how from this view the quilting doesn't take away from the actual pattern of the quilt. 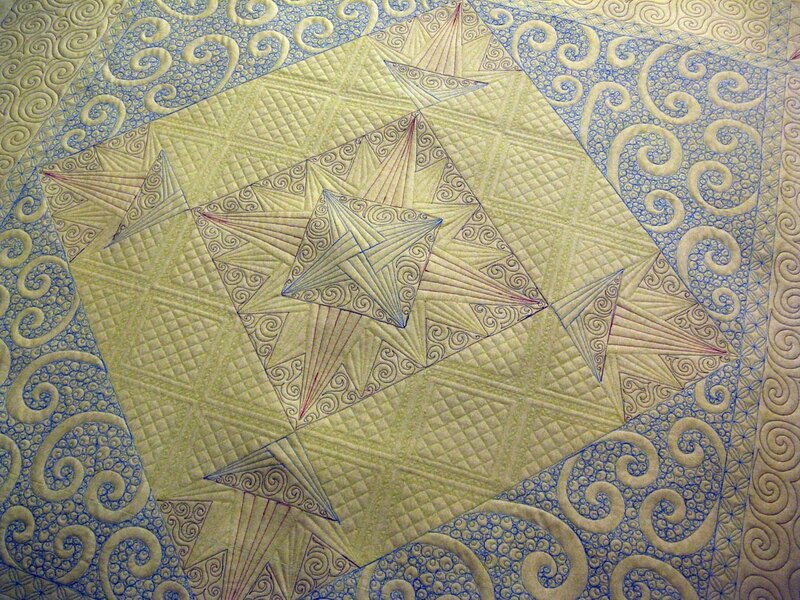 Then, once you get up close you see the beauty of the quilting. 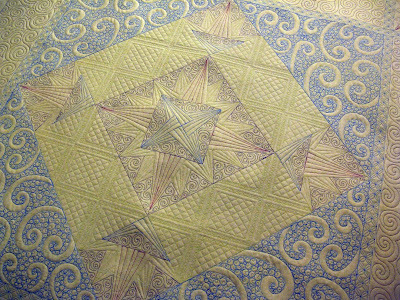 The colors are a bit off here, but you can really see the detailed quilting. I love how the large blue triangles were quilted to match the fabric used. I also LOVE the light blue sashing. 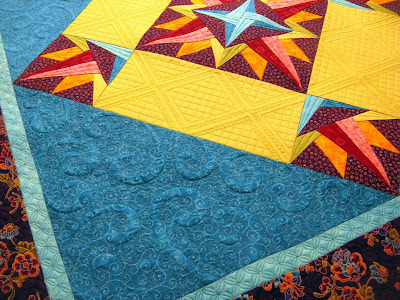 I think the quilting there is fantastic and perfect for that spot. 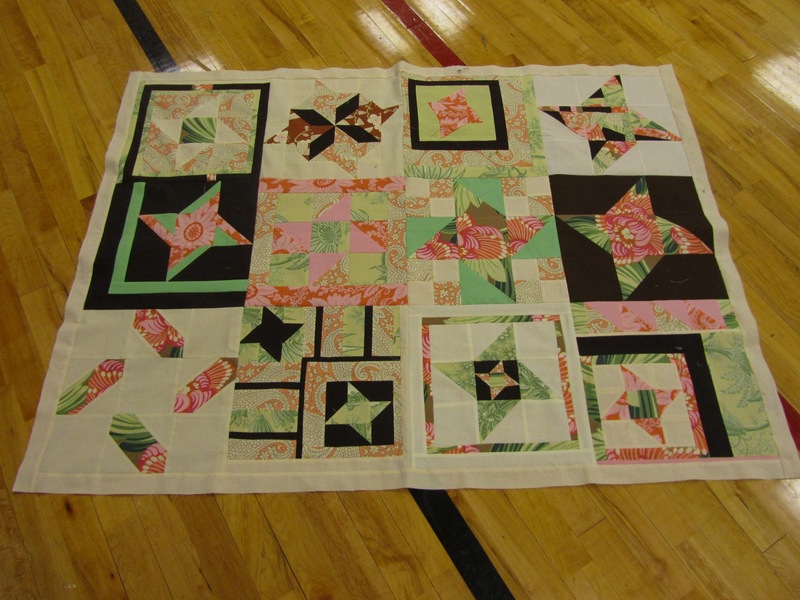 Check out the quilting in the green area. It's so different and fun. 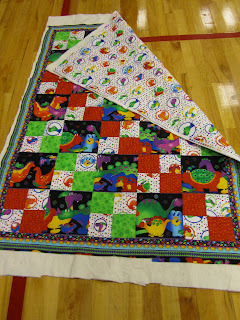 And here are a few photos of the back of the quilt. 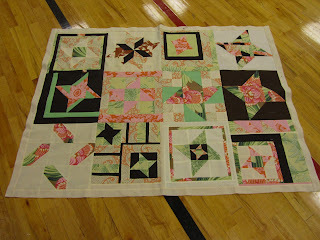 It's the same green on the front and I love the way you can see all of the quilting so clearly on the back. 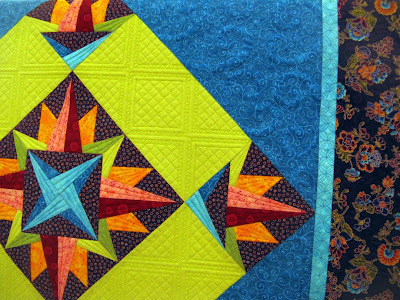 The back is one of Judi's favorite things about a quilt. 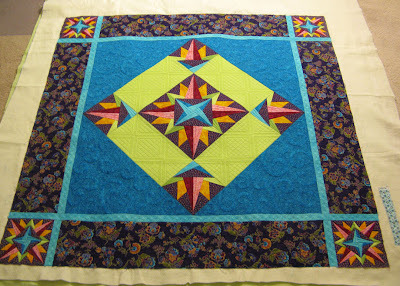 I don't know how many of you follow the fabulous work for Judi over at Green Fairy Quilts. If you don't you should. She posted a blog post today about her sense of fashion and low and behold, in the background is MY quilt on her machine. Holly Cow!!! I'm so psyched to see what she does with it. Run over and see what she's done so far. 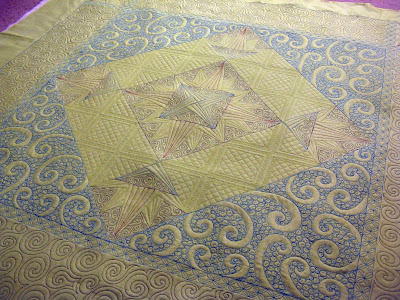 http://greenfairyquilts.blogspot.com/2011/02/attempt-at-fashion-ha-ha.html Her work is absolutely amazing. If you haven't seen her work before, scroll through her blog posts to see for yourself. 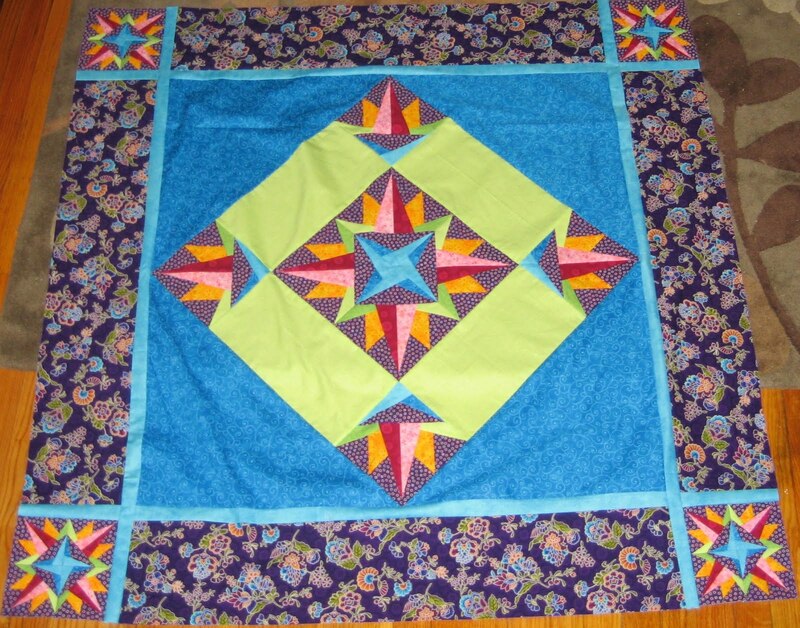 This is the quilt that she's quilting for me. I can't wait to see the finished product. You have no idea. 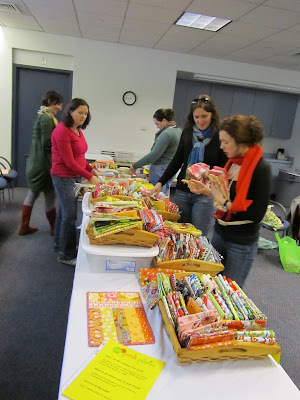 Last Saturday was our January meeting of the NEMQG. 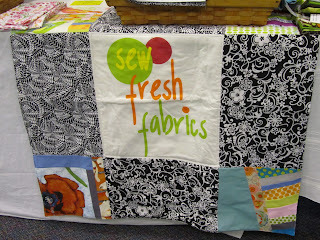 We met up at the Arlington public library where we were greeted by a trunk show from Sew Fresh Fabrics. 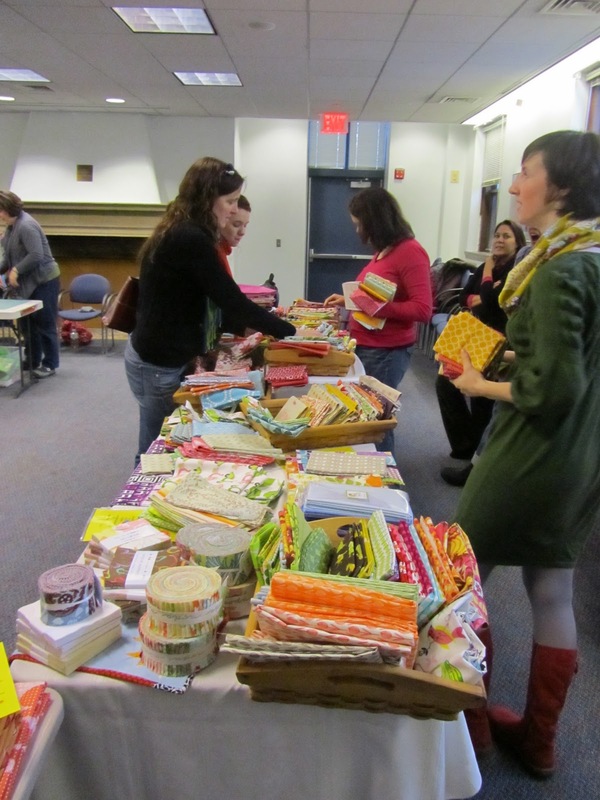 They talked all about what it is like to own a fabric store on etsy and what it's like to work in the fabric industry. 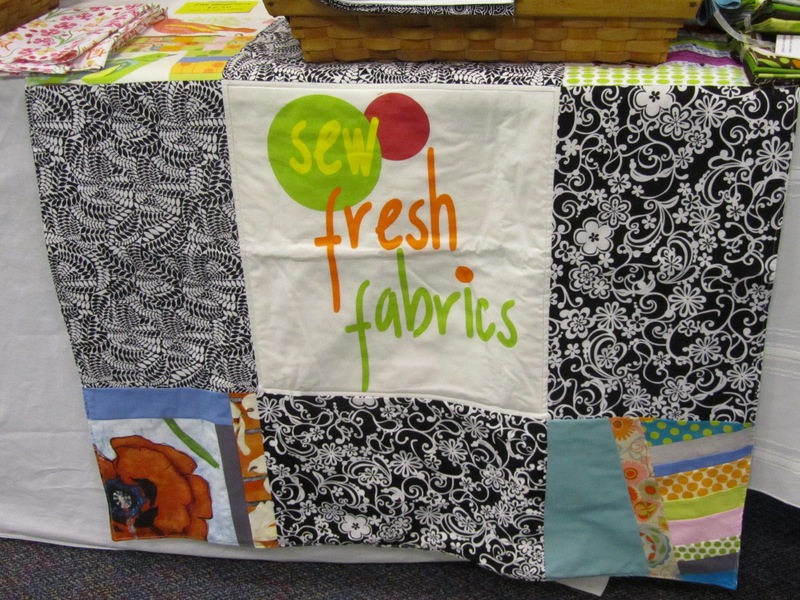 After, we all had a chance to purchase some of their great fabric. 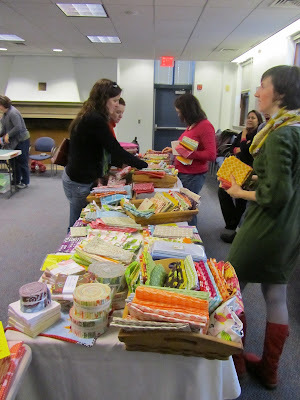 Here we are digging through everything, making a mess, and buying lots of fabric! These are the goodies that I came away with. 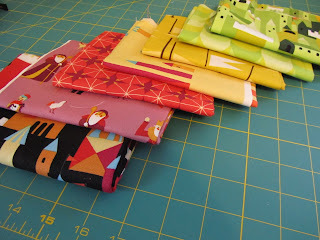 I don't know if I've ever mentioned how much I love Art Gallery fabrics. Well, I love Art Gallery fabrics. 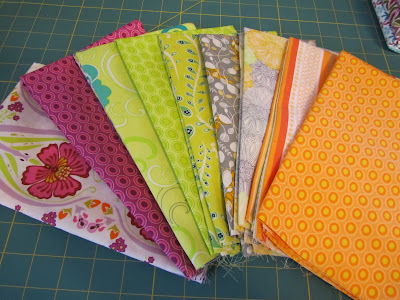 I'm not a big orange person, so some of these fabrics are a bit out of my comfort zone. I also managed to snag some Castle Peeps fabrics. 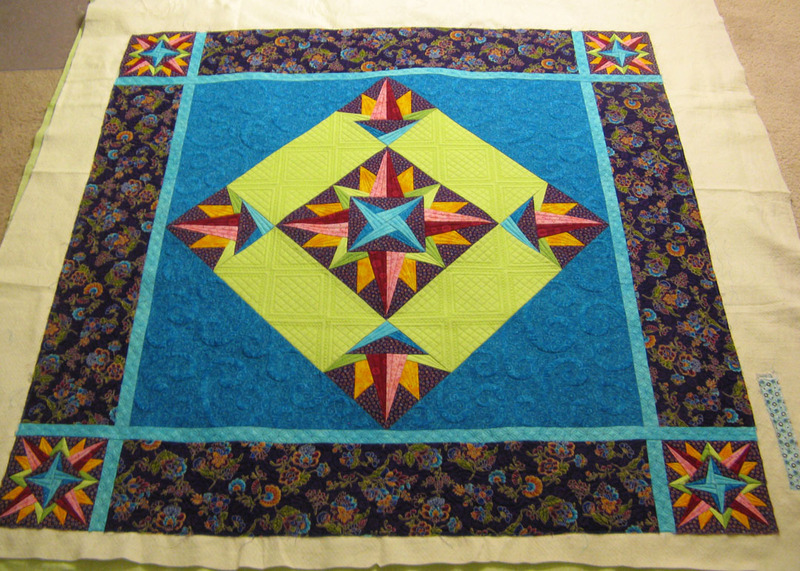 6 fat quarters and a half yard. I'm not sure what I'll do with this, but this was one of those lines that I was hoping to get before you couldn't find the line anymore. Last Saturday was our January meeting of the NEMQG. At the meeting we gave Laurie her bee blocks. She provided some awesome purples, grays, and white to make a very cool block. 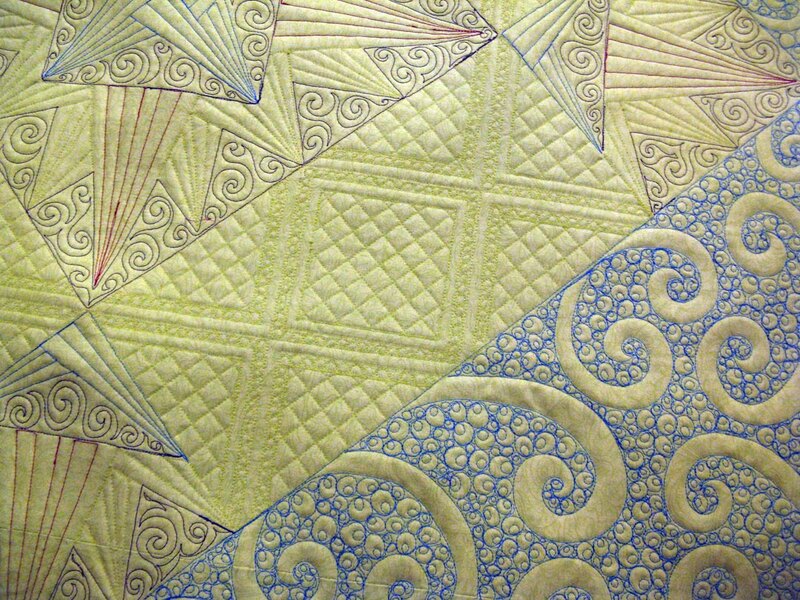 I absolutely loved the colors Laurie picked and would love to make a quilt using this colorway sometime. Here are all of the blocks together. 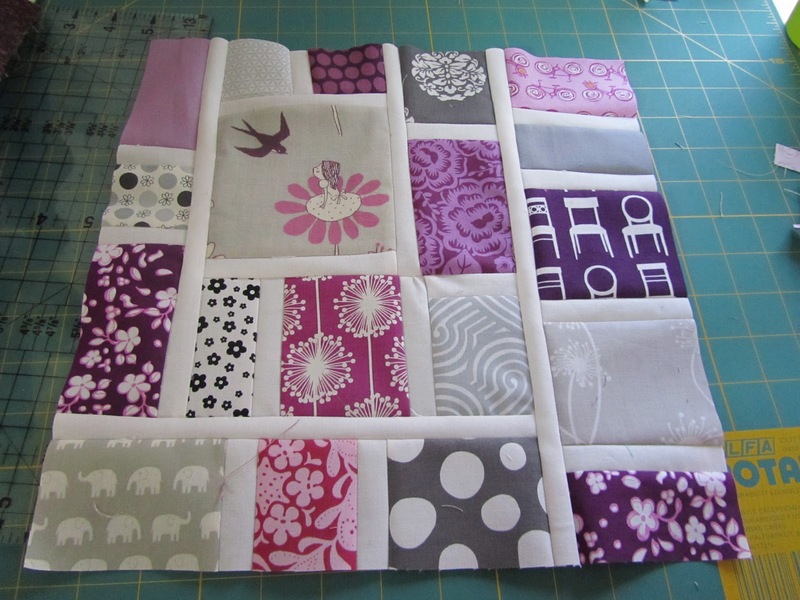 This is going to be one great quilt. I can't wait to see what Laurie does with it.